The Travel Tester takes you to Japan this month. We're starting off with a series of tips on places to visit in Tokyo. So sit back, relax and enjoy reading! You can say that here at The Travel Tester, we’re a bit obsessed with Japan. I (Nienke) visited twice in 2006 and three times in 2008. Recently, Nick and I both had the chance to return to Tokyo, during our blog trip to the Okinawa Islands. In the meanwhile, we’ve gathered enough brochures and shot enough photos and video’s that it’s almost a crime not to share it with you. That’s why the month of September is all about our favourite country: the land of the rising Sun! We’ll kick the series off today with a brief overview of some of the neighbourhoods in Tokyo that we loved to visit ourselves and will take it from there to zoom into specific neighbourhoods, where to go in Tokyo for fun activities, the best restaurants and other fun places to visit in Tokyo (and beyond). We hope you enjoy all our upcoming articles, any questions, please ask! Looking to visit Japan as an independent traveller, but need a bit of help? Meet ViaHero! This company assists your trip planning by pairing you with a local. This way, you have the opportunity to talk to someone who really knows the area well so you will get the absolute most out of your experience. They will give you ideas for authentic experiences, insider knowledge and even phone support if you need it. Start building your own customized independent trip to Japan here. And if that’s not all, readers of The Travel Tester get 5% off the ViaHero planning service by using this link! Looking to go bar hopping in Tokyo? Then check out Magical Trip for the best guided food tours in Shinjuku, Shibuya and Asakusa! We kick this Tokyo Guide off with our favourite neighbourhood Asakusa. This is where you can get that feeling of ‘old’ Tokyo. This corner of the city used to be Tokyo’s entertainment district, but it got completely destroyed in the Second World War. While most of Asakusa dates back to the ’50’s these days, most buildings have been reconstructed after the originals, so wander past pagoda’s and shrines and perhaps you’ll even spot one of the last Geisha’s of the city! With its large park, Ueno is a great place to escape for the day and visit some museums, for example. The area is originally a working class district and because it’s located northeast of the Imperial Palace, it’s considered an unlucky place to live. You’ll see many homeless people in this area, but we found it really quite safe here and you’ll be sure to enjoy yourself on the Ameyoko Market, or any of the cultural institutions and attractions in the park. Don’t skip the Ueno Zoo, a good place to spot a panda! Tsukiji is world-famous for its large fish market. While the word ‘Tsukiji’ literally means ‘landfill’, with 2800 tons of fish that gets sold per day it’s definitely more eye catching than promised. While not all sellers are too keen on tourists walking about, if you stick to the rules and don’t interfere with their business, you will be fine. Done with the fish? Perhaps visit the Tsukiji Hongan Temple, an unusual church-like structure that has Western and East-Asian features. When you think of Tokyo, you probably think about the famously busy pedestrian crossing in the Shibuya. The neighbourhood is popular for young people as it’s the place to shop and party. Fancy Karaoke? This is the place to do it. Manga Cafés? Also here! Never a dull moment in this part of the city. If you come to Japan for the funky gadgets and Japanese pop culture, then Akihabara is the place for you. During the Second World War, a black market for electronics developed in the area and later, when the shops became legit it also started specializing in offering English configurations and manuals especially for tourists. Oh, and you’d almost forget, but this area has some stunning shrines and temples as well, so don’t miss those in all the craziness. The Odaiba district lies on a large artificial island in Tokyo Bay. It is one of the only places in Tokyo where you can access the ocean. the island was build to defend Tokyo after American warships forced Japan into trade agreements in 1853. Odaiba is a great place to admire the skyline of Tokyo, and you’ll find many entertainment complexes, shopping malls, hotels and restaurants here. If you love architecture, this is the place to go. Check out the observation decks on either the Fuji Television building or the Telecom Center. Shinjuku is one of the largest Tokyo Neighborhoods and while during the day you gaze up to the skyscrapers, at night you’re even more amazing with the incredible amount of neon signs lighting your way. From the craziness of the bar area Golden Gai (lovingly named ‘piss alley’) to the peace and quiet of Shinjuku Gyoen (park), this neighbourhood is just one of those must-see places to visit in Tokyo. Visit the Tokyo Metropolitan Building for great views over the city, or have a drink in Lost in Translation’s bar at the Park Hyatt Tokyo Hotel. Ah, the Robot Restaurant Tokyo. You’ve probably already had someone telling you to visit it on your next trip to Tokyo, so we won’t do that. As a matter of fact, we decided to spend the 8000 Yen entrance fee on a quiet dinner in another part of Tokyo, but if you’re curious then here is the brochure for you to check it out. Marunouchi is Tokyo’s largest business district and perhaps not the place where you expect the Imperial Palace, although this is of course the place in Tokyo where all the money is, so there’s that. In 1890, the Mitsubishi family bought the entire area for 1,5 million yen and you can still find their headquarters here today. Another major sight in the area is Tokyo Station, of which the design is slightly based on Amsterdam’s Central Station. Escape the crowds and walk around in the Imperial Palace East Gardens, which are lovely. If wondering where to go in Tokyo for the best mix of modern pop culture and historical Tokyo, then Harajuku is your best bet. Located between the two biggest Tokyo neighborhoods (Shibuya and Shinjuku), you can find a massive park, as well as many shopping streets (Takeshita Dori being the most famous) in Harajuku. Visit Yoyogi Park for some good people watching and definitely don’t miss the Meiji Shrine, where you have a good chance of walking into a traditional Japanese wedding. Posh, Posher, Ginza. That about sums up what you can expect in this Tokyo neighbourhood. At the height of Japan’s economic glory in the ’90s, land in Ginza could reach to over 100 million Yen for a square meter. No surprise then that for fashion brands and department stores opening a location in Ginza is considered the ultimate status. Lovers of architecture will have a good day out here as well. At night, you’ll find many bars, lounges and nightclubs in Ginza as well, but bring a creditcard and dress well to get into the small venues. If you visit Ginza on the weekend, you can walk freely as the area has been closed off for all traffic. Sweet! The main street of Omotesando is often compared to the Champs-Élysées in Paris: a wide boulevard lined with trees… oh and shops, lots of shops. It’s pretty much an extension of the shopping streets in Harajuku, except with a sharp contrast going from the teenage, bargain hunting-shoppers in Harajuku to the big spending older crowds in Omotesando. You’ll find great architecture in this area and many flagship buildings such as Prada, Louis Vuitton and Dior. But if you ask us honestly, our favourite shop here is Kiddyland, a 5-floor toy store where you just can’t go wrong. Yanaka is one of the few districts in Tokyo where you can find that old town ambience and it’s one of our most recent ‘finds’. You can walk to this area from Ueno Park and escape a bit from the metropolitan feel of other parts of the city. Yanaka Ginza is the main shopping street, where you can find traditional shops selling goods and produce. Another attraction of the area is Yanaka Cemetery. Many of the tombs are decorated and nicely landscaped. You can also find the grave of Tokugawa Yoshinobu, the last shogun of the Edo Period of Tokyo here. Yanaka Ginza, even in the rain it’s pretty! Roppongi is a district of Minato in Tokyo, Japan. It is famous for the Roppongi Hills and its active night club scene. The area is popular by young people & foreigners to go out and clubs can range from large, multi-level establishments, to smaller one-room clubs located in upper levels of buildings. With several art museums, Roppongi can also be appealing to culture lovers. Have you been to Japan already? 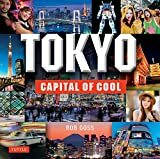 What places to visit in Tokyo would you recommend? Wanderpass is an App that guides you through the city by voice as if you were in a museum. Simply open up the app for the Tokyo Walking Tour, put your earphones on and start walking at your own pace to see all the highlights of the city, that only locals know.